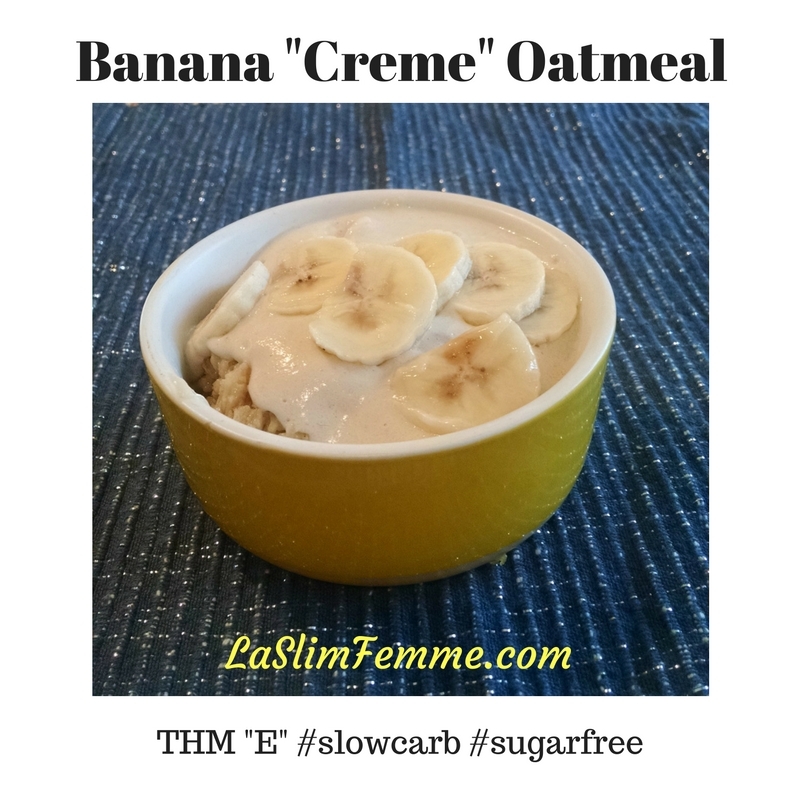 This banana “cream” oatmeal is a clean E in TrimHealthyMama parlance. If you are in weight loss mode, you can choose to leave the banana out, adding flavor with banana extract. But if you’re in maintenance mode (or if bananas don’t cause you to gain), go ahead and add the banana! I have always loved oatmeal, but it didn’t like me. After eating it, I would be ravenous within half an hour. 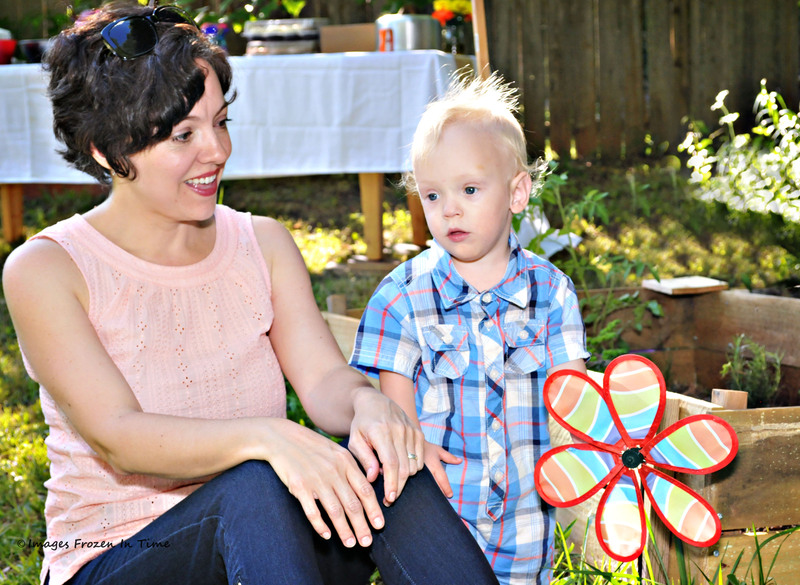 With TrimHealthyMama, this is no longer the case. I can now enjoy oatmeal without my blood sugar crashing. The key, of course, is protein! Cook 1/2 cup (dry) oatmeal with 1 cup water, a dash of salt and 1/2 teaspoon butter or coconut oil. While it’s cooking, put 1/2 cup low-fat cottage cheese and 1/4 banana into a blender (or, skip the banana and just use banana extract). Add 1/2 tsp gluccomannan and stevia to taste, a dash of banana and/or vanilla extract. You can also add 1 T whey protein and a scoop collagen if you like. Blend until creamy. Top the hot oatmeal with banana “cream”. This recipe keeps me full until I can eat again 3 hours later. Enjoy it with your favorite Trimmy beverage. Again, if you’re still losing and want to avoid bananas, leave it out entirely and just add the banana extract. Also, you can leave out the butter or coconut oil and instead add up to 1 Tablespoon chopped nuts. How do you like your oatmeal a la TrimHealthyMama? Note: You can get banana extract at WalMart and some other large grocery stores. I prefer to order my extracts from OliveNation because they have great prices on organic (with no propylene glycol!) flavorings. 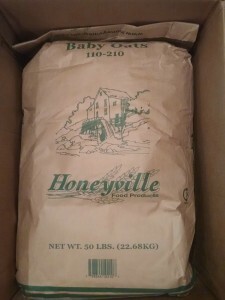 And to save money, I buy oats in bulk , shown below, from Amazon. This works out to be half the price of buying it even at the cheapest grocery store, per pound. Since my large family uses oatmeal every day, this is a smart move for us. Yummy! I can;t wait to try this! I made this for lunch and it was terrific! I might either halve or skip the glucc next time. It made the texture more bread-puddingish than oatmeally. ? But I am definitely full!